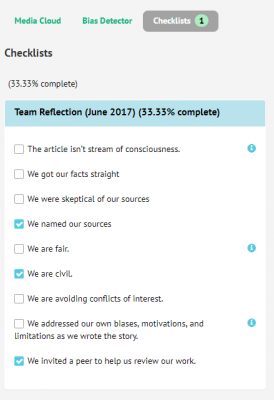 The NewsFrames platform is designed to help teams collaborate on research, analysis and writing projects related to news framing and other nonfiction investigations, large or small. The platform incorporates media-related data tools and team checklists, all within a multilingual space. The NewsFrames platform is a powerful tool, full of features that encourage collaboration and make research, analysis and writing streamlined and efficient. This brief guide will teach you the basics of the NewsFrames platform. If you have any questions, be sure to contact us. We'd love to help. After receiving your profile setup notification email (note: at this time, access to NewsFrames is by invitation only), navigate to www.newsframes.org and login with your email and password. 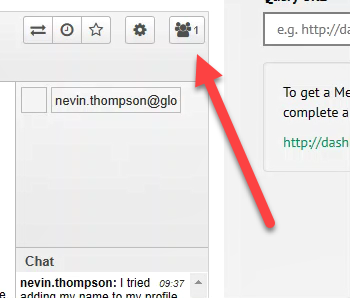 Set up your profile by clicking on the profile link in the top-right corner of the tool bar. Be sure to choose a username that makes it easy for collaborators to identify you when working on projects. After making changes, you will need to save with your password. NOTE: When possible, the NewsFrames platform will appear in your preferred language. 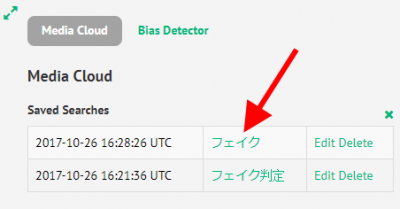 Note that our media analysis tools may have their own language limitations. If you are interested in translating NewsFrames into a language, contact the NewsFrames team. 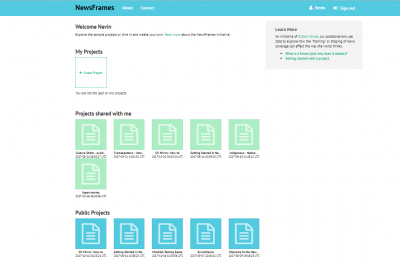 NewsFrames provides an online space to observe, initiate and collaborate on research projects. Anyone with a link can view these projects. To make your project Public, select “Edit”, then select “Public”, and then select “Submit”. Your project will then be public; project tools, including checklists, will not be visible. You can start a project in your own personal sandbox before sharing with others. If you're looking for ideas about how to carry out your research project, take a look at different public projects, which demonstrate how the NewsFrames platform is used. The Project Dashboard is the main NewsFrames platform interface. It acts as a powerful tool during each step of your research project, to help you and your team. Writing pads allow you to create different “pads” for taking and organizing notes and writing the results of your investigation. A visual editor allows you to format your text when you are ready to publish it. Import research from plain text or HTML formats. Version control allows you to save revisions, track changes, and revert to previous versions of your draft. Use a variety of Media Tools as you work on your document. 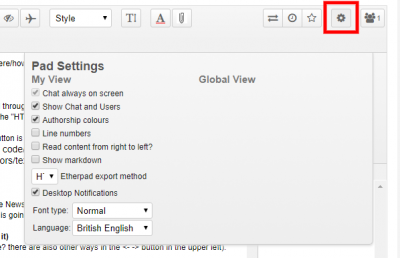 Selecting Pad Settings allows you to show or hide chat, as well as display authorship colors and other collaboration tools. You can also choose default fonts, default editing language and other features. The NewsFrames Dashboard is based on Etherpad. For more information about formatting and collaborating using, see documentation on the Etherpad Wiki. Invite collaborators to join at any stage of your NewsFrames project. To add team members to your project, click on the green “collaborators” button. 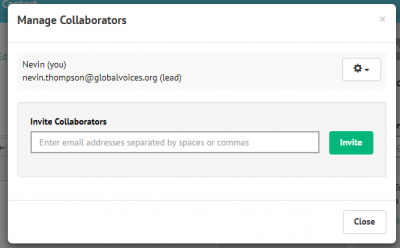 Next, invite collaborators by the email address associated with their NewsFrames project account. You can also assign project roles or transfer ownership of the project to collaborators. There are three levels of user roles, with different levels of privileges: Administrators, Project Leads and Members. 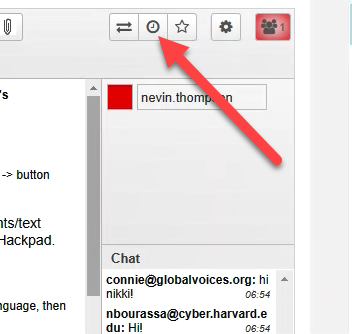 Click on “show the users on this pad” to see who is working on the document, and start chatting. For more information about how to add collaborators, see here. NewsFrames makes it straightforward to view edits by different authors and collaborators. Select the Timeslider button… . and you'll see the latest version of the text, as well as who edited it. Pushing the Playback button in the top right will then show the revision history of the document. 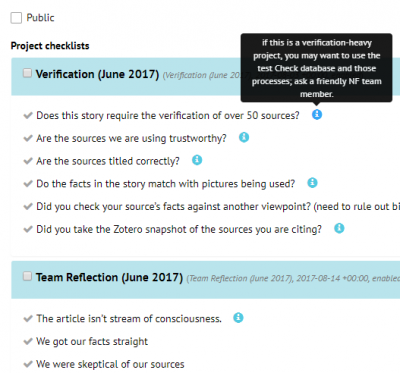 Checklists are convenient ways for the project team to remember processes and methods for your project research and writing. They are reusable, language-localizable, and customizable at the administrator level. Examples and more about our suite of growing checklists can be found here. Users are presented with the possible checklists that can be incorporated into their project at the time of project creation. The lead can also opt to add on or remove checklists throughout the life of the project. Checklists will appear in the language of your preference (defined in your profile) when possible. If no translation exists, the checklist will appear in English, the system's default language. Read checklist items to remind yourself and your team of steps to take in your story exploring or writing process. A hint (i) is sometimes available to the right of a checklist item: you can hover over it to see what it says.Checklists are currently only able to be marked by the Story project lead. After checking off completed items and hitting submit, percentages of overall checklist completion are displayed. 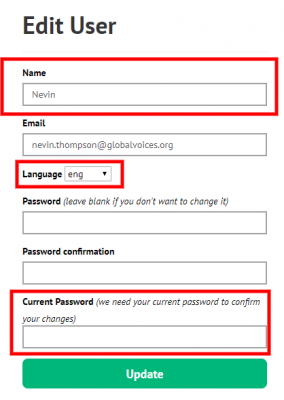 Create the English version of the checklist in a .CSV file. All checklists must be in English, the default language of the NewsFrames platform. Create a CSV of two columns: the first columns contain checklist items, and the next column contains helpful reminders or hints about the items. The text can contain simple HTML anchor tags to link to external references or documents. If you would like to have a translation of this checklist available, create the translation CSV file as well. Make sure that you translate each item from the English list into the desired language in order. The resulting CSV should have the same number of rows, columns, and cells filled. You'll see a list of checklists. Textboxes on the right define what the checklist items are for, in order to help you determine which checklist is right for your project. The checklist should now appear in the panel to your right in the NewsFrames interface. 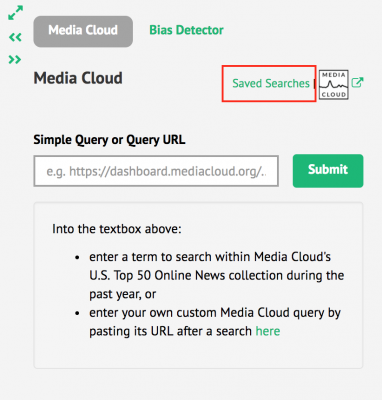 Currently, NewsFrames offers two analysis tools for media exploration: the macro-level, environmental platform Media Cloud and language analysis at the sentence to article level, Bias Detector. Media Cloud is a joint project by the MIT Center for Civic Media and the Berkman Klein Center for Internet & Society at Harvard University. Documentation for Media Cloud can be found here. Bias Detector functionality (more soon), an experimental collaboration around Natural Language Processing algorithms with Georgia Institute of Technology's Behavioral Modeling and Computational Social Systems Group. Media Cloud is an open source platform developed by the MIT Center for Civic Media and the Harvard Berkman Klein Center for Internet and Society. Media Cloud is designed to aggregate, analyze, deliver and visualize information, while answering complex quantitative and qualitative questions about the content of online media. Or, enter a simple term and hit “Submit.” Returned results come from a limited search on US top 50 sources for last month. NewsFrames allows you to quickly access Media Cloud to analyze and compared media for keywords, trends and more. We are currently experimenting with collection and fact checking tools like Zotero and Check. If you have completed your story, or want to circulate outside of the NewsFrames platform, it's easy easy to export in a variety of formats. 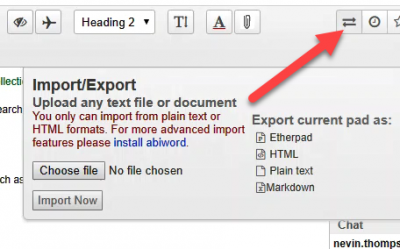 Select the import/export button in order to export as HTML, plain text, markdown or Etherpad formats. This method will give you your text, with formattings in bold/italics/headers preserved as well as links to the image files or links to URLs.